Oh man, I am so excited for Bout Of Books and pumped to kickstart my 2014 reading. I am really hoping that Bout Of Books 9.0 will help me to get ahead on my reading challenge for this year (it is 260 books and right now I am at 5 books read). Note: I only want to get up to page 380, or halfway through this book. “In his highly acclaimed debut, Scott Lynch took us on an adrenaline-fueled adventure with a band of daring thieves led by con artist extraordinaire Locke Lamora. Now Lynch brings back his outrageous hero for a caper so death-defying, nothing short of a miracle will pull it off. After a brutal battle with the underworld, Locke and his sidekick, Jean, fled to the exotic shores of Tal Verrar to nurse their wounds. But they are soon back to what they do best–stealing from the rich and pocketing the proceeds. Now, however, they have targeted the grandest prize of all: the Sinspire, the world’s most exclusive, most heavily guarded gambling house. But there is one cardinal rule: it is death to cheat at any game. Note: I will be excited to FINALLY finish this trilogy. Also? This book is SOOOOO short! “Jacinda was supposed to bond with Cassian, the “prince” of their pride. But she resisted long before she fell in love with Will�a human and, worse, a hunter. When she ran away with Will, it ended in disaster, with Cassian’s sister, Miram, captured. Weighed down by guilt, Jacinda knows she must rescue her to set things right. Yet to do so she will have to venture deep into the heart of enemy territory. “Sometimes there’s no easy way out. Victor hates his life. He has no friends, gets beaten up at school, and his parents are always criticizing him. Tired of feeling miserable, Victor takes a bottle of his mother’s sleeping pills�only to wake up in the hospital. Bull is angry, and takes all of his rage out on Victor. That makes him feel better, at least a little. But it doesn’t stop Bull’s grandfather from getting drunk and hitting him. So Bull tries to defend himself with a loaded gun. “Critically acclaimed author Melissa Kantor masterfully captures the joy of friendship, the agony of loss, and the unique experience of being a teenager in this poignant new novel about a girl grappling with her best friend’s life-threatening illness. “Emma is tired of being good. Always the dutiful daughter to an overprotective father, she is the antithesis of her mother — whose name her dad won’t even say out loud. That’s why meeting Siobhan is the best thing that ever happened to her…and the most dangerous. Because Siobhan is fun and alluring and experienced and lives on the edge. In other words, she’s everything Emma is not. So, that’s my Bout Of Books pile, way more chill than in previous years! Are you doing Bout Of Books? What’s in your pile? Leave me your link if you did a post! I so should be doing this too! If it’s not too late, I might actually join and do this tomorrow 😀 Sounds like fun! Good luck with your goals, April. I think you’ll enjoy Afterparty, it’s a quick and very entertaining read (I really love Ann Stampler and her writing style, tho some find it too wordy). I was also really surprised by how short Hidden was too, especially for the final book in a trilogy. Sadly, I was disappointed in the outcome of this series, mostly because of the romance. I guess it will all depend on which side you fall on when it comes to Cassian v Will. The rest of the story was nicely resolved though, so there’s that. I just got done reading Maybe One Day and ohhhhhhh myyyyy goooooooood. I honestly did not expect it to break my heart as much as it did. But as you can imagine, that is one sad, soul-killing book. Keep some tissues at hand! Good luck on your Bout of Books goals! I’m signed up and hoping to read at least 5 books. I liked Hidden but I haven’t read any of the other books on your list. It sounds like you have a good mix of genres to pick from. Maybe One Day looks really good. The comparison to The Fault in Our Stars is certainly promising. Good luck with the read-a-thon! This is my first year doing Bout of Books and I’ve decided to do it on my personal blog instead of on I Eat Words! Right now I’m reading Grasshopper Jungle by Andrew Smith and planning on reading The Orphan Master’s Son by Adam Johnson next as it’s my book club’s read this month. Smart idea to put up how many pages and the book’s blurbs! Hope you like Hidden! I enjoyed it. 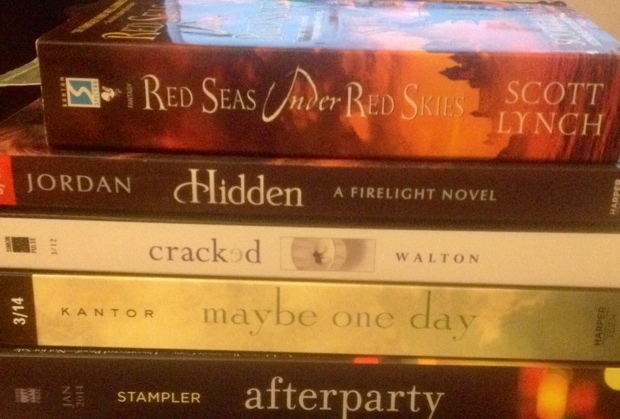 I think We Were Liars is up next but I might wait until later in the week! I finished Magic Study and read Defy and Biggest Flirts today. Yay for a too cold to go outside day! Good luck!